been unveiled as an exquisitely designed space to create a truly memorable stay, an event – or the unique combination of both.Occupying an impressive 660 square metres on the 14th floor, the Penthouse features an inviting living area perfect for entertaining guests, a master bedroom set away from a second smaller bedroom for added privacy, outdoor terraces overlooking the city, and an event space with an outdoor area and a 208 square metre indoor room that can be converted further into two smaller spaces for more intimate events. Our Penthouse is immaculately designed to create a truly memorable stay and event experience, best available rate from CNY120,000+ / USD 17,314+ per night. Piero Lissoni, renowned architect and founder of Lissoni Architettura in Milan who also designed The Middle House, continues with the same modernist aesthetic in the Penthouse with touches of both Italian and Chinese culture in its design and furnishings. 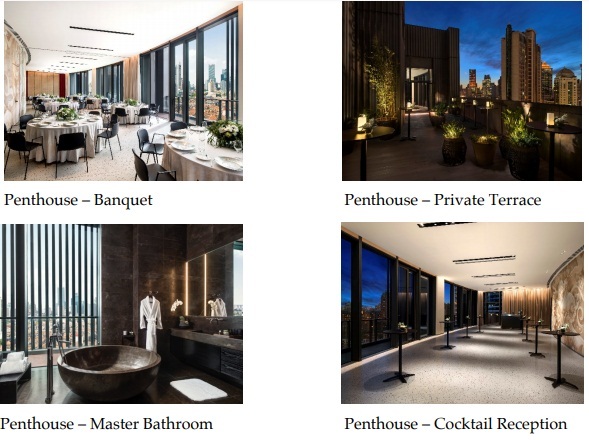 The attached private function area has the versatility to be split into two separate spaces, transforming the Penthouse from the quintessential home away from home into a sophisticated venue suited for events of all sizes – from intimate soirees to gala dinners or cocktail parties for up to 200 people hosted in style. For other special occasions, The Middle House also offers smaller event spaces ideal for groups of 6 to 20 guests such as the Gray room, and the Wine room at Café Gray Deluxe. The Italian restaurant, Frasca, can host 70 guests for a dinner on the outside terrace for some al fresco fun, while Sui Tang Shang, above the Chinese Restaurant, comfortably accommodates 80 guests for cocktail style events.